The Pentax 15mm f4.0 SMC DA ED AL Limited Lens has been designed exclusively for use with digital SLR cameras. 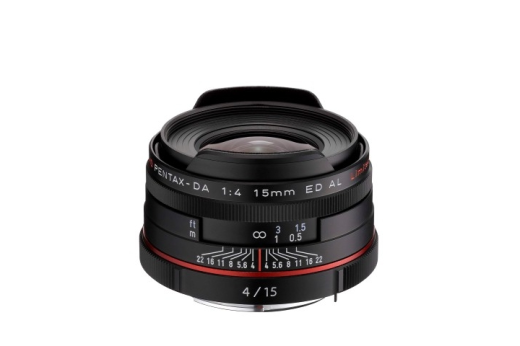 The 15mm focal length provides an equivalent of a 23mm lens (35mm format) and an angle of view of 86 degrees. This Pentax 15mm f4 incorporates hybrid aspherical and extra-low-dispersion glass elements for superb image quality with good contrast and minimum distortion and colour aberrations. The high-grade aluminium lens barrel with integrated hood ensures the lens is compact, lightweight, but robust. Being part of Pentax's "Limited" series, the 15mm f4.0 SMC DA ED AL lens inherits high-quality image reproduction and high-grade lens-barrel finish, while providing users with a unique ultra-wide-angle perspective.